In recent years, Vietnam is known as a country with a rich cuisine with many delicious dishes. Food is an important part of the culture of Vietnam. It is also an interessant way to spread and attract international tourists. 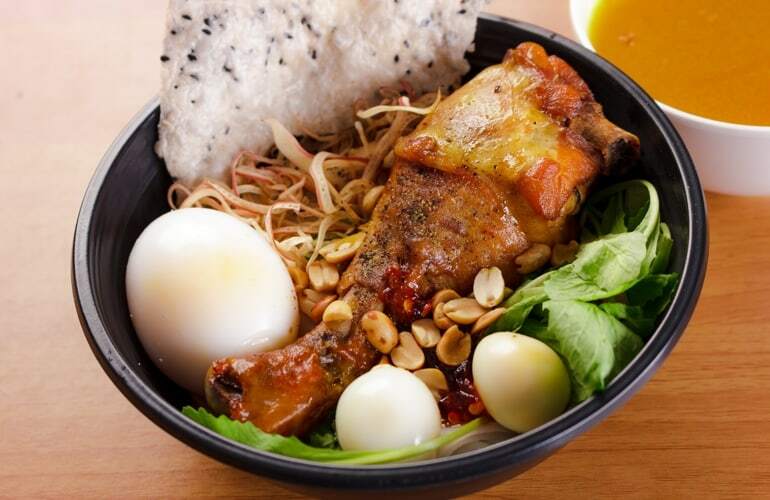 If you are going to travel to Vietnam or just be curious about the cuisine of this beautiful country, why don't you take a look over the 8 must-eat dishes. In a special way, you can eat these vietnamese dishes anytime throughout the year. In the summer or autumn, in the cold of winter or in the warm of spring, you will feel different flavors depended on each season or each time of the day. So, let’s discover special vietnamese dishes below! The first traditional vietnamese dish is Pho, it is a special gift of Hanoi, the capital of Vietnam. 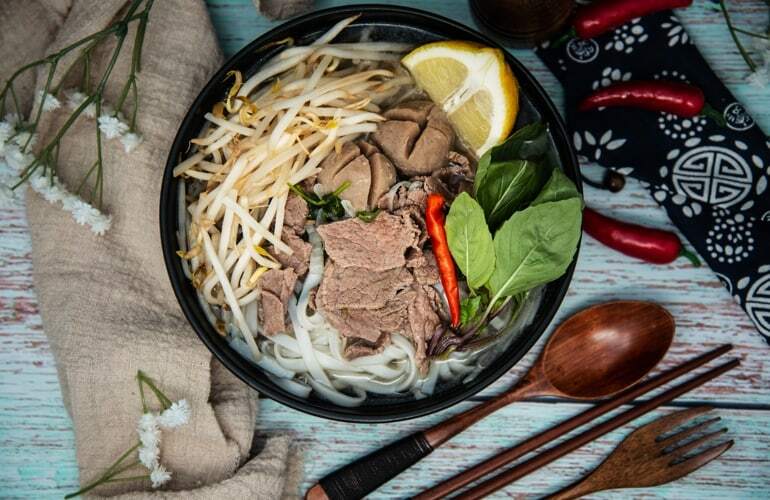 In fact, Pho appears everywhere all along this country, from countryside roads to city alleys, from sidewalk to luxury restaurants and even street vendors. But only in Hanoi it is always the best. 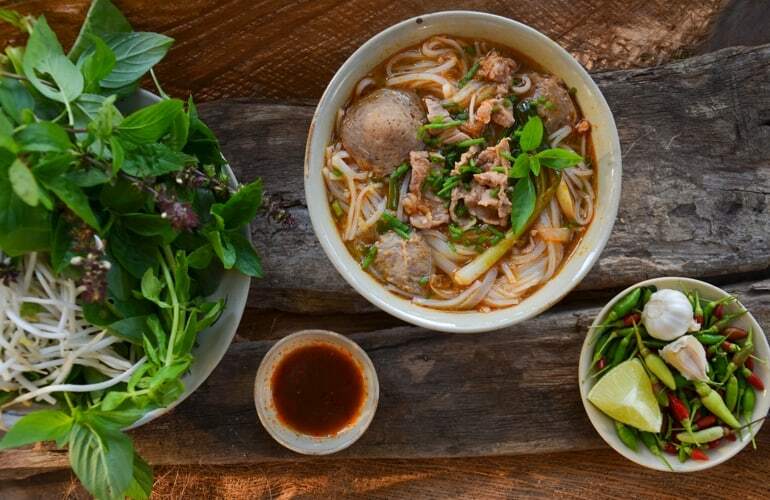 Pho is now widely known in many countries around the world and it is considered as a symbol of Vietnamese cuisine. Pho is liked because of its sweet water that combines the essence of how many ingredients. The smell of pho is unique that anyone can enjoy once will not forget. The success of the cook is to make all the ingredients from water, rice noodle to meat and herbs. Like Pho, Hue beef rice vermicelli is known as a traditional vietnamese cuisine not to be missed. If Pho is a special gift of Hanoi, Bo Bun will be a gift of Hue - Imperial City, the ancient capital of Vietnam. The main ingredients of Bo Bun are vermicelli, beef muscle meat, pork trotter, chopped meat and boiled pork blood. The broth of Bo Bun is not the same as any other broth. This is secret of the delicate combination between bone broth, fish sauce (a type of fish sauce typical of Hue), fresh lemongrass and red peppers. With these simple ingredients and sophisticated processing of Hue people, Bo Bun has become a private brand of the ancient capital, which has made the food more attractive for domestic and foreign tourists. We do not know ever since Nem has become a traditional Vietnamese dish. In fact, it is considered as a way of introducing special vietnamese cuisine that the Vietnamese people want to treat international friends. Indeed, Nem is a quite diverse dish. Depending on the region, people will use different ingredients such as minced meat, shrimp or crab, mashed carrot, black mushroom. But generally, these ingredients are mixed with spices and rolled in a thin rice paper wrapper. Then, it is fried in hot oil, fragrant and crispy, eaten with sweet and sour sauce, cucumber, lettuce and herbs. If you don’t like a dish with a lot of oil like Nem, Goi Cuon will be a good choice for you. It is one of the most popular appetizers in vietnamese food culture. In addition, it is very simple to make this dish. It consists of boiled shrimp and (or) pork, fried egg, vegetables, herbs, rice vermicelli. Then, all of them are wrapped in a rice paper. Goi Cuon is often served with a kind of special dipping sauce - fish sauce with garlic, limes, chili and crushed roasted peanuts. 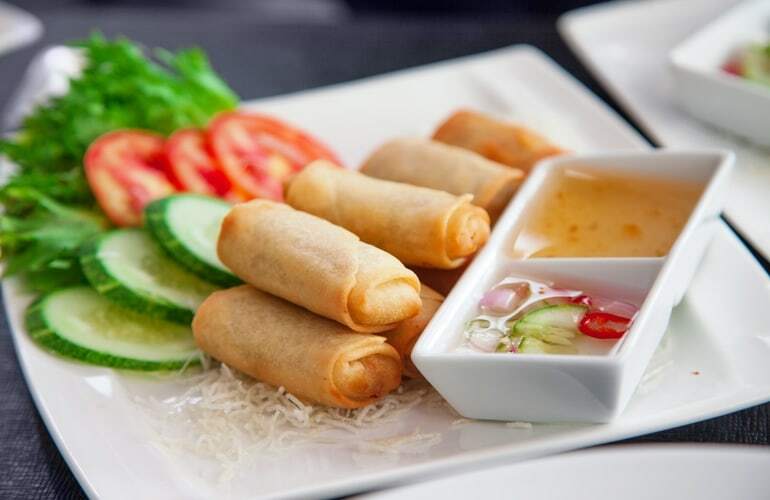 And in this way, the combination of herbs, pork, shrimp and the special dipping sauce makes Vietnamese fresh spring rolls wonderfully unique. The French brought bread to Vietnam but it was the Vietnamese who brought it to another level. 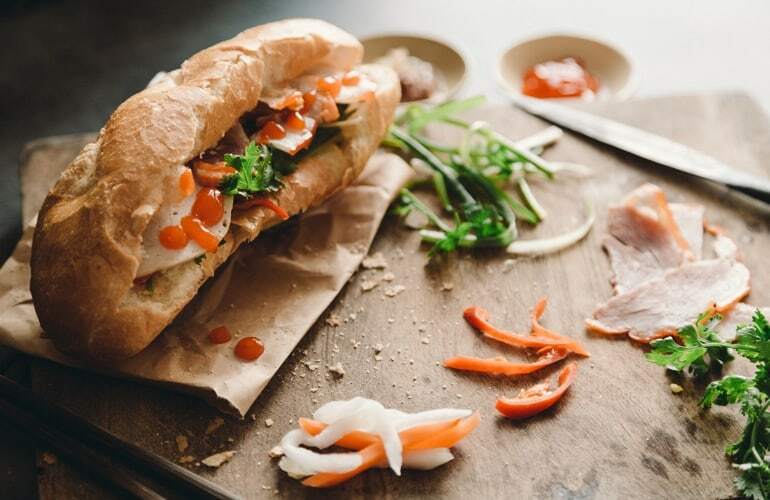 It is so famous, that you can easily meet a vietnamese bread restaurant with the name Vietnamese Bread in almost any land around the world. It is varied, but the most famous is the traditional bread. The combination of fragrant crispy bread, fat pate, vietnamese pork sausage or grilled meat, a little vegetable, pickles, and some special sauces will make you fall in love with its flavor. Actually, every country has a pancake. 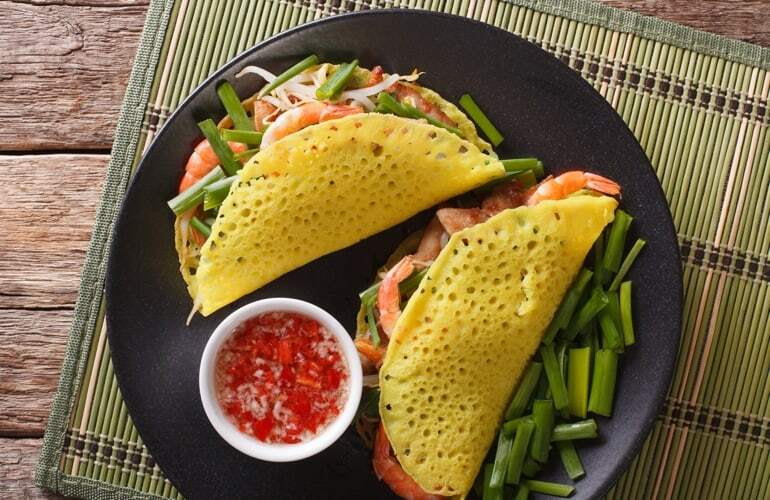 If the US is known by Buttermilk pancakes, Japan with Okonomiyaki or Crêpes in France, Vietnam also has its pancake - Banh Xeo. It is a very delicious dish with crispy crust pie. This pancake is a mix of shrimp, meat, bean sprouts and a bit more herbs. 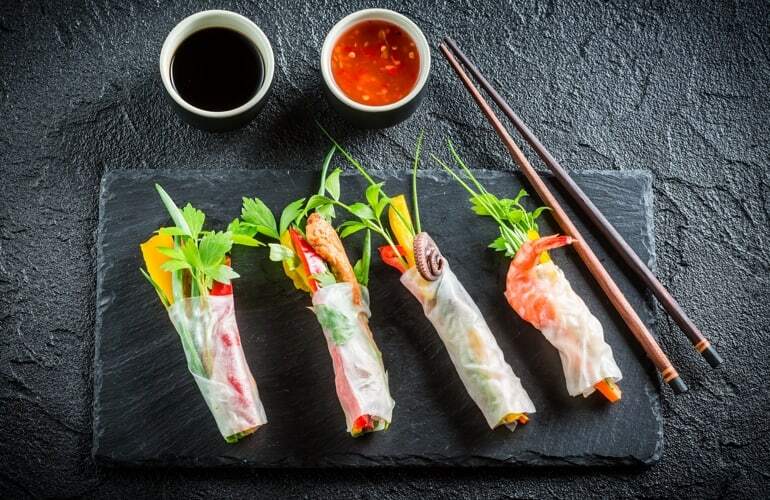 To enjoy this vietnamese dish, you just cut a corner of the pancake then roll it with thin rice paper, vegetables and pickles then dip it into specially prepared sauce. The blending of many flavors make this pancake perfect, which makes it become an indispensable dish at the party in the countryside. My Quang is a typical and popular dish for people of central area of Vietnam. It is cooked quite easily and adaptable in all circumstances. What makes the difference of My Quang is its turmeric noodles. Besides, we can cook My Quang with shrimp, chicken, frog, crab, fish or pork depending on the taste of each family. This dish is often served with vegetables, roasted peanuts, finely chopped green onions, fresh herbs, red pepper and a hard-boiled egg in a turmeric sauce. Each type of ingredient offers a unique flavor, so for sure it will be very delicious and you will not forget it once enjoyed. Bun Thit Nuong is a favorite food in all three regions of the country. It is also made by thin rice vermicelli like Bo Bun, but the difference in the way of processing has made a distinct flavor for this dish. The ingredients are quite plentiful. 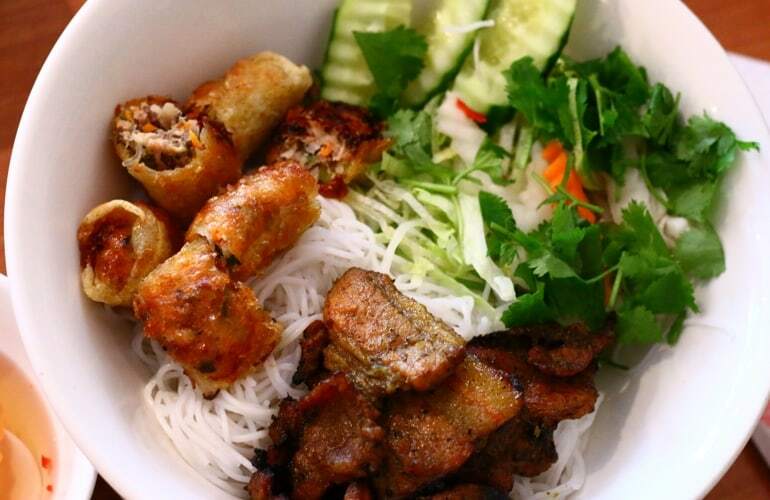 This is a combination of rice vermicelli, grilled pork, Nem, fresh herbs such as basil, lettuce and mint, fresh salad, bean sprouts and cucumber. It is dressed in fish sauce and topped with a little bit of roasted peanut, pickled carrots and green onion. The freshness of vegetable with delicious taste of grilled pork and attractive colors will make a perfect vietnamese dish. Therefore, It is difficult for you to resist the attractive appeal of the dish.